The elite Tata Steel tournaments in Wijk aan Zee are underway and take place from January 13-29, with two main tournaments, the Masters with both Magnus Carlsen and Sergey Karjakin as headliners, as well as Wesley So, Levon Aronian, Anish Giri, Baskaran Adhiban, Radoslaw Wojtaszek, Ian Nepomniachtchi, Richard Rapport, Dmitri Andreikin, Wei Yi, Pavel Eljanov, and Loek van Wely. All rounds in Wijk aan Zee begin at 1.30pm, except for the last round on 29 January 2017, which begins at 12.00pm. Both rounds on the Chess On Tour days start at 2.00pm. Consider the engine evaluation graph. Notice how it gradually climbs in the space of five moves from move 22 to 27, from equal, to dead lost. Meanwhile Adhiban continues to show off creative play. 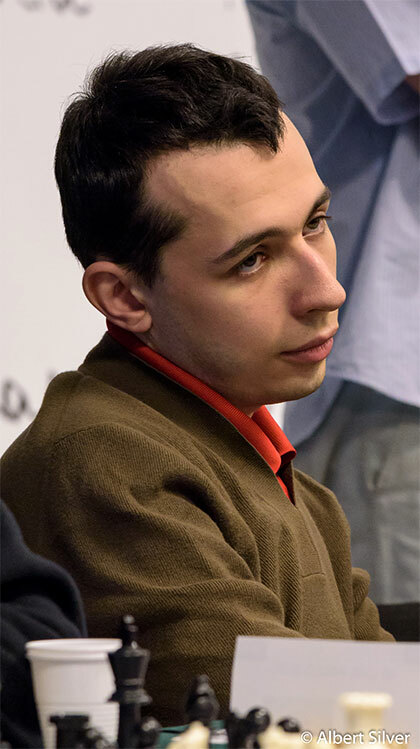 He is shying away from the Italians and Ruy Lopez that have been dominating the elite for the last year, and instead now follows up his King's Gambit with a Vienna Game! Andreikin tried to steer the game towards a Closed Sicilian structure, but his king did not survive, with more annotations by Aleksandr! Baskaran certainly has reasons to be happy! Here he is with legendary commentator Yasser Seirawan. So retains his lead, now followed by Wei Yi and Eljanov, but there is a big group of players trailing only one point behind! Those are Carlsen, Adhiban, Aronian and Karjakin. With five rounds to go anything could still happen in this edition of Tata Steel. So plays Aronian with the white pieces, while Carlsen will be going for full blooded revenge against Van Wely. Perhaps noticing how exciting the round today at the Master's was, the Challenger's slowed down their pace somewhat today as, instead of the usual seven decisive games they have been providing us for the last few rounds, they drew six of their games. Still, the round was full of fun games. Nils Grandelius played a sacrificial game against Eric Hansen, and even though the computers gave him a line to get a strong advantage at the end of the game instead of taking the perpetual, it was extremely tough to see and evaluate. Aryan Tari's 50% is exactly his performance rating! With these results Markus Ragger and Gawain Jones continue at the lead, but it's, like the Master's, anyone's tournament still. adhiban is firing !!! adhiban is firing!!!! An excellent game by Rapport. Carlsen's position is unpleasant due to the weakness of the c5 pawn, even before 22...d3. White has the sort of tiny edge that the World Champion himself is adept at exploiting. It may be that Black is OK after 22...Rb8 23.Rxb8+ Qxb8 24.Qa5, but how many players, even Carlsen, in their calculations would then consider 24...Qc8, walking into a pin? It's a computer move- a good one that holds everything together, but not a human move. Carlsen played 21...d4 with the intention of 22..d3, not to be slightly worse. So it is 21...d4 that deserves a question mark, as 21...dxc4 looks fairly equal. Nice analysis by Aleksandr Lenderman, especially on Eljanov, P - Wojtaszek, R.
" ... an erratic player ..." that beat the World Champion in great style!